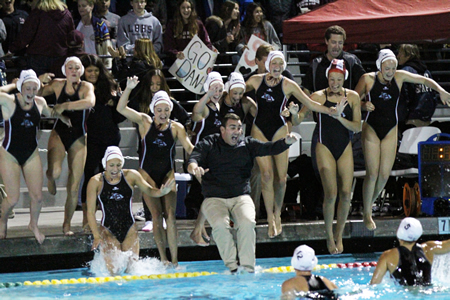 Coach Ethan Damato’s juggernaut topped last year’s magical run by taking the top-division prize again this year in the CIF’s Southern Section championship held Saturday, Feb. 28, in Irvine. For the 80-year-old Laguna Beach High School, the title is the school’s 40th all-time section sports crown and the 11th competing in the top division. 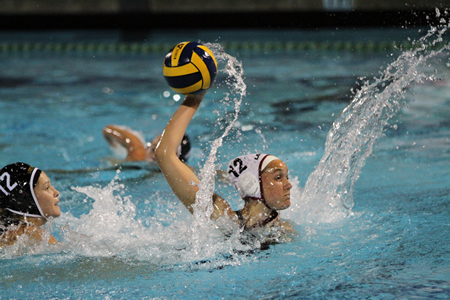 The water polo team’s win streak is now 52 and the season’s results set new school records by the Stanford-bound standout, Makenzie Fischer. 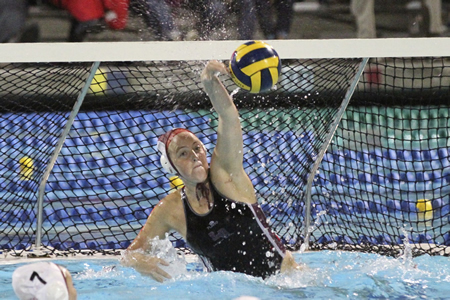 She eclipses goals and point totals by former student Annika Dries, who also went on to play for Stanford and win a gold medal in 2012 on the U.S. Olympic water-polo team. Facing Foothill for the fifth time this season, Laguna found itself down 2-0 only to rally for an 11-6 victory and their second straight crown before a large overflow crowd at Irvine’s Woollett Center. Aria Fischer led all scorers with five goals against Foothill. Foothill started off with two quick goals by Cana Manzella, but the Breakers adjusted with the Fischer sisters keeping Manzilla slient for the rest of the match. Makenzie Fischer got Laguna on the board at 1:47 remaining in the period and almost had a second goal that was ruled not to have completely crossed into the cage. Foothill picked up a goal to make it 3-1 with 43 seconds left in the period, but momentum really changed when Taylor Julson came off the bench to finish the first half. She fired a bullet off a pass from Bella Baldridge to cut the score to 2-3 and then tied the game on the opening possession of the second quarter off another Baldridge assist. From there Aria Fischer took over scoring off a Baldridge pass, a Julson toss and another Baldridge assist and the Breakers led 6-3 at the intermission and were in control. Makenzie Fischer draws a trio of Foothill Lady Knights during CIF finals Feb. 28. In the second half, every time Foothill scored to think they had a chance, the Breakers countered and kept pulling away. Laguna was five for eight on power plays while Foothill could only convert twice on five Laguna exclusions. Scoring: A Fischer – 5, M Fischer -3, Julson -2, Evans – 1. Breakers ended the season with a perfect 31-0 record while Foothill finished at 26-5 losing only to Laguna this season. The Knights had won six D-I titles and were in their eighth D-1 finals in the eighteen seasons of playoffs. The Breakers have won four titles, D-4 in 2001, D-2 in 2009 and now back-to-back D-1 championships. 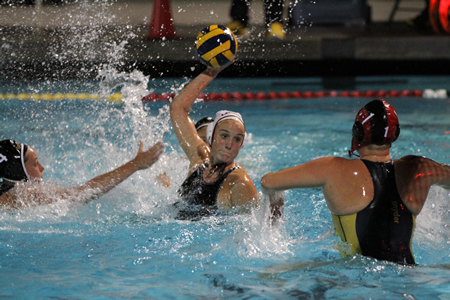 Holly Parker recorded 12 saves against Foothill at the CIF final.